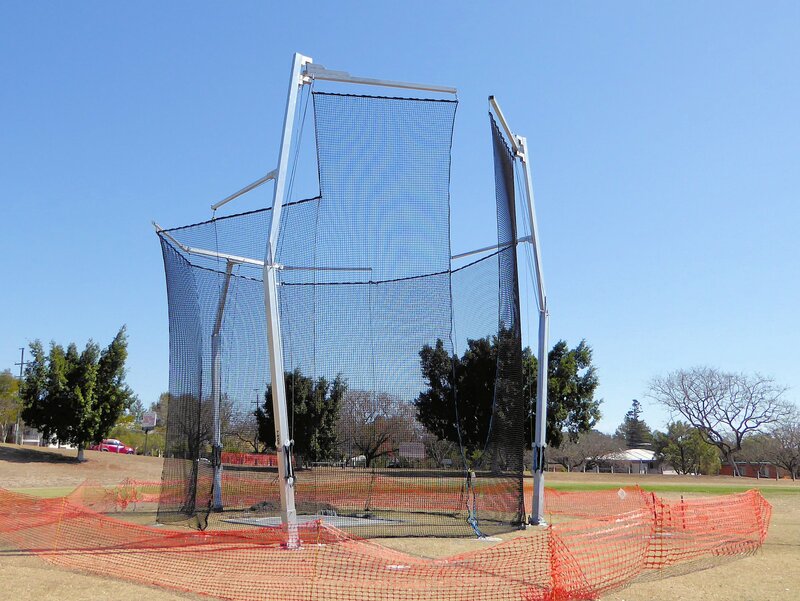 Australia’s leading sports equipment manufacturer Play Hard Sports Equipment (PHS) is gaining a lot of interest from the UK regarding the IAAF accredited Thor 9 hammer discus cage – as a leading choice of IAAF certified throwing cages. In the US, the National Collegiate Athletic Association (NCAA) has accepted all International Association of Athletics Federations (IAAF) cage specifications as “meets NCAA Specifications”. Previously only NCAA specified cages were acceptable for installation across 1,281 North American institutions. The IAAF specified cages (there are two sizes approved by IAAF) have a narrower throwing zone than NCAA cages and therefore able to better restrict wayward implements. UK Athletics have a rule regarding throwing cages, saying that all cages should be compliant to IAAF rules. The proposed rule change will be “IAAF certified”. Most cages in the UK (pre-date the 2004 rule change which extended the gate pivot position from the centre of the circle to 7.0m.) will either be modified or replaced over time. Continued lobbying from Denis Wilson of Athletics Australia in 2014, the IAAF approved a reduced size cage with gate pivots that are 4.2m from the circle, 9.0m high and 3.2m wide. The Hurricane 1 (Cyclone 2 ) C2 wind rating means that nets can remain erected in winds up to 74mph (117kph) and the benefits to councils, schools and clubs are the net does not need to be lowered during storms or normally strong winds. Therefore, the net can remain erected longer for greater usability for the athlete training 24/7, 365.